I’ve been a dietitian for four years. My background is in the biomedical sciences; I studied Behavioural Neuroscience and I completed my Honours in exercise physiology. For a while I thought I might pursue a career in sport science. But it was a chance meeting with Karen Inge in 2008 that swayed me to become a dietitian. And I haven’t looked back since. 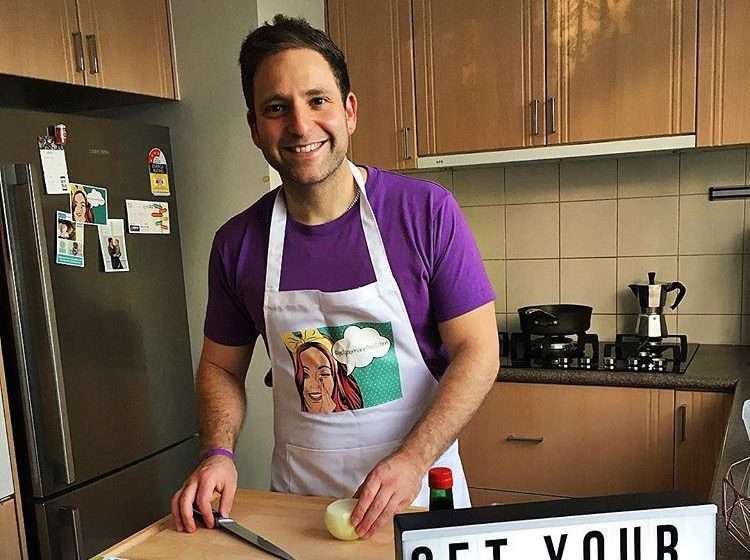 You’ve got the whole #getyourmaninthekitchen thing, can you tell us a little bit about that? The campaign is about encouraging men to get back in the kitchen and have a crack at making their favourite meals. I believe that all foods can form part of a healthy diet. With that said, I also believe that any type of meal can be made healthier by tweaking ingredients or by employing different cooking methods. I think there is such a heavy reliance on take away foods, and UberEATs has really exploded into the market. I try to encourage my clients and the general public to get back in the kitchen to create balanced and healthy meals. I think that at one end of the spectrum you have people who don’t have any cooking abilities, but then I think on the flipside to that, with shows like My Kitchen Rules and particularly MasterChef is that people have a real interest in cooking. But what I find is that there’s a bit of a disconnect between health and cooking. I really try to put that health perspective back in the forefront of someone’s mind. My message is to include more vegetables, cut back on the extra fat and salt. It’s certainly not about creating the perfect meal; it’s about creating a healthier one. Studies show that when people cook their food at home, they consume less calories overall, but they also consume less sugar, less saturated fat and salt. So, it’s going to lead to those better health outcomes. I’ve heard you are doing some TV stuff with Abbott. What does that involve? I was recently approached by a TV producer to work on a show called My Market Kitchen to showcase how Ensure Plus can be incorporated into different recipes. So, I was lucky enough to get my mug on telly and it’s actually screening as we speak—3.30pm Monday to Fridays. I collaborated with another dietitian from Sydney, to show how Ensure Plus can be used in various recipes like cheesecakes and muffins and pancakes. The average person in the community might turn around and go “Well, there not exactly healthy meals.” But really, we use Ensure Plus for those that are nutritionally needy. So, people who need those extra calories and need the extra protein as well, and certainly the extra vitamins and minerals. Beefing up some of those types of meals with the Ensure Plus can actually help someone meet their nutritional requirements. It was a really exciting initiative and certainly my first foray into television. I do a little bit of media work, but it was a really fun and exciting opportunity. I certainly couldn’t pass up such a gig! I know that apart from that Abbott thing, you’re mostly focusing on Men’s Health. What are some of the ways you feel like you contribute in that area differently to a normal dietitian? Blokes in the profession are often referred to as unicorns. I think that other blokes may connect better with another bloke. Reiterating my philosophy that all foods can form part of a healthy diet, it’s also about tweaking certain ingredients. I think that type of message resonates with men. If you are using an example such as chicken schnitzel, then I would challenge my client to consider an alternative way of preparing the chicken and encourage them to carefully consider what they serve it with. I don’t know if I hold the key for ways to improve men’s health, but I think it’s really about the messaging that will hopefully get that cut through. Is there any nutrition advice that you give which surprises people? I think a few of my recommendations surprise people and that’s really because there’s so much misinformation and confusion around nutrition. However, I think when you provide that context and education people are mostly open to my suggestions. I’ve had numerous experiences where people say to me “Last night before coming to see you, I ate a whole chocolate bar” or “I ate a cheesecake because I thought you’d tell me that I would never be allowed to eat that again.” However, I practise a non-diet approach. I really do try to encourage people to still enjoy their favourite foods, but also to look at ways to either reduce portion or reduce the frequency. Yes, you can still have chocolate, probably not a whole block; and yes, you can still have cheesecake, probably not a giant slice, but actually encourage people to eat mindfully. I think some of those messages resonate with people and I would hope that my clients are pleasantly surprised. What kind of cooking recommendations or recipes do you make for a classic Aussie bloke who doesn’t usually go beyond throwing some meat on the BBQ occasionally? It’s the KISS philosophy – keep it simple, stupid. I think it’s about sharing recipes and meal ideas that are really quick and easy. It’s a matter of working smarter in the kitchen, not harder. For example using ready-to-go ingredients and employing healthy cooking methods to whip up meals. For example making use of tinned legumes, frozen veggies etc. to create a balanced meal is sage advice. I know that a lot of recipes online might have 20 or 30 or so ingredients, very few people are going to want to cook that at home, especially on a weekday. When someone gets home at seven or eight o’clock, it’s about trying to give them those tools to help them eat better. So, if it’s cooking eggs on toast with veggies or making a piece of pan-fried chicken with a salad on the side, I think that’s really the key to help nurture someone to eat better. My approach is to dumb it down. It’s about finding ways to help someone make healthier food choices. That approach appears far less intimidating than the 20 or 30 ingredients approach. Definitely, and I think that’s where a lot of people go wrong. A lot of so-called “nutrition experts” go wrong because they lose sight that of that and they lose sight of the lay person and their ability in the kitchen. But I think when you really level with someone and you actually get an idea of what else is going on in their world: they might work long hours, they might have a family, they might have other responsibilities at home; cooking might not necessarily be a priority for them. They definitely want to eat better, but they just don’t quite know how to put it all into practice. Guiding them is crucial. Do you have an opinion on meat-free days? It is certainly an initiative that I like to get behind. I’m a big believer in plant-based diets. I would call myself a flexitarian, I think it’s a bit of a buzzword these days, but I do try to adhere more to a plant-based diet. In my household, we try to eat more tofu and certainly try to make use of legumes. They are certainly underutilised. The recommendations are about two to three serves of legumes a week, and I think you’d be hard pressed to find anybody, other than a vegetarian or vegan, who would meet those requirements. I’m big believer in pushing out that message. A lot of blokes will say that, “It’s not really a meal if it doesn’t have meat,” but actually it’s about reframing that information and repackaging it in a different way and showcasing different meals and how they can be really healthy as well as tasty. I reckon Shane Warne was on a good thing when he used to travel with baked beans. We know that legumes are a fantastic source of plant-based protein, but also a whole lot of other nutrients, including fibre. The health benefits of fibre shouldn’t be understated: it can help with our gut health, help reduce cholesterol, help with glycaemic control, and even weight loss. Do you have any other strategies for clients who eat a lot of red meat? It is always about baby steps. If someone’s heavily reliant on red meat, it’s about introducing other things into their diet. So, you could even look at encouraging your client to consume a little bit more chicken into their diet, and certainly more fish. I think a lot of blokes would not meet the recommended serves of oily fish. However, it’s about focusing on those small, subtle changes that someone can make, and maybe it’s a matter of saying “Hey, let’s get behind Meatless Mondays. So, for one day of the week, I encourage you to forgo meat on that day. Let’s also look at some plant-based options.” I think that might not be as daunting, so I guess that’s how I would approach a bloke who would be heavily reliant on red meat. As I said before, it’s not necessarily about having the perfect diet or the perfect option, it’s about having a better option or working towards a better diet. Do you take a similar approach with people who drink a lot of alcohol as well? For example, someone who has five beers a night or something? Yeah, absolutely, it’s the same approach. It’s about looking at small, subtle ways to reduce their overall intake. So, I think if you were to say to somebody who drinks five beers every night, and they have done for a number of years, if you were to say: “Never drink alcohol again,” you just wouldn’t get cut through with that client. They probably wouldn’t take that advice on board and you’d probably never see them again. But if you were to approach it from a different angle and say “Okay, let’s look at some strategies, actually useful strategies, of how to cut back your alcohol intake,” I think that message would actually resonate with somebody. So, perhaps exploring strategies such as non-alcoholic spacers in between, or even mindfulness. That is the type of messaging that I would employ and encourage other health professionals to when meeting with such clients. What are some of your go-to recipes for yourself? There’s a joke in my household that we call egg-based dishes “breakfast for dinner.” So, I guess a go-to dish for me would be something like baked eggs or something like a big breakfast, which would include some poached eggs, baked beans, spinach and mushrooms on toast. I think that’s a super easy option. Tofu stir-fry is a bit of a go-to option for me as well, and certainly porridge for a hearty brekkie in the colder months. Obviously, you’re a busy man, what about dinners? Do you do most of the cooking for dinner? In fact, I wanted to be a chef growing up, but my parents talked me out of because of the long working hours and poor working conditions. And I’m really glad now that I still work with food, I’m just on the other side of the counter, so to speak. Cooking strongly features in some of my messaging and what I’m trying to highlight as well. So, I’ve got the best of both worlds. Joel Feren is the director and principal dietitian at Hearty Nutrition. He is an Accredited Practising Dietitian with a background in the biomedical sciences. Joel is currently working in aged care where he manages the dietetic services of a number of residential care facilities across Melbourne. He has consulted to the Box Hill Hawks (Hawthorn Football Club affiliate) as well as various blue-collar businesses. Joel is a self-described foodie who loves to cook and has a passion for the role of diet in the prevention and management of chronic disease. To find out more about Joel, check out his website and his Instagram.